I’m stitching on 28 count evenweave from Silkweaver Expressions (this is an “old Silkweaver” and the color is no longer available but I think the closest match would be called Precious Metals) and I’m using DMC variegated thread (#115 garnet) instead of the usual sampler silks. I still haven’t decided what to put in the circle that you can customize in the upper wreath section. I wanted to do something different than the usual anniversary date, but nothing is really springing to mind. I’d love to hear your thoughts and ideas, please drop me a comment below. This first little bit took me about an hour and a half to get done. I always have this strange self-doubt in my ability to count when I’m placing the first handful of stitches into a new start. Also, I’m really liking having a needle minder, I’ve only been using one for the past month or so but they’re pretty handy to have. My January 2013 stash acquisition to kick of the new year with was the chart and supplies to stitch My Token of Love by Rosewood Manor, along with a few extra packs of my favorite John James Needles because you can never have enough extra needles. Over the past year I’ve been eyeing several of Rosewood Manor’s patterns and they’re quickly becoming a favorite for me. If you’ve been following my window shopping adventures here on the blog you’ve probably seen them pop up a few times. Have a fantastic day and happy stitching! Available from 123stitch.com or Stitching Bits and Bobs. Model stitched on 35 Ct. Cornsilk linen with Weeks Dye Works floss (or DMC alternates). Stitch Count: 170W x 120H. It’s a two-for-one pattern pick today, because these two patterns from Lila’s Studio are the perfect companions to each other. You can find these beautiful bees at the Lila’s Studio Etsy page or at 123stitch.com. Both project models are stitched on a 40 count fabric in the color “Mello” by Picture This Plus using Weeks Dye Works threads, but DMC alternatives are listed. 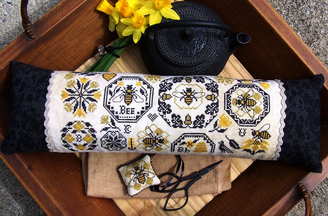 Save the Bees has a stitch count of 167w x 166h and Bee Sampler is 188w x 84h.